You may not be aware , but there might be many duplicate files on your windows PC . As you keep using your PC , duplicate files keep piling up without your notice . These duplicate files contribute to the wastage of your PC’s storage space . Whats worse is that , a lot of duplicate files will lead to a crowded hard drive that will eventually slow down your PC’s performance significantly . Like Its easier said than done , it is impossible for somebody to manually search for each and every duplicate files in a PC . Its not a task that we can do easily . So theres a tool which can help you up with the searching duplicate files , but you still have to delete the duplicate files yourself . After all some things are better left to humans rather than a machine with zero IQ . 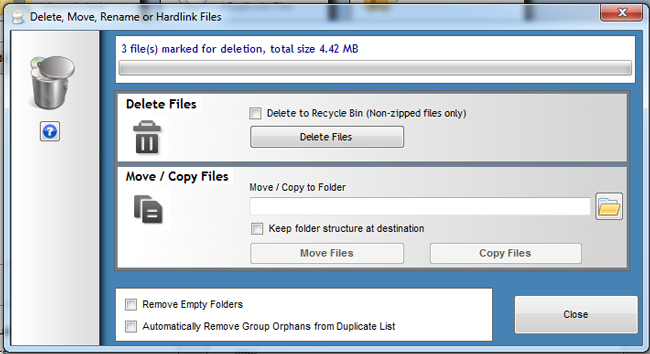 Duplicate cleaner is one such tool that can find out all the duplicate files from your windows PC and delete them . As the name suggests it effectively cleans out all duplicate files from your PC . At the first look the programs interface might look confusing but its very easy to use . 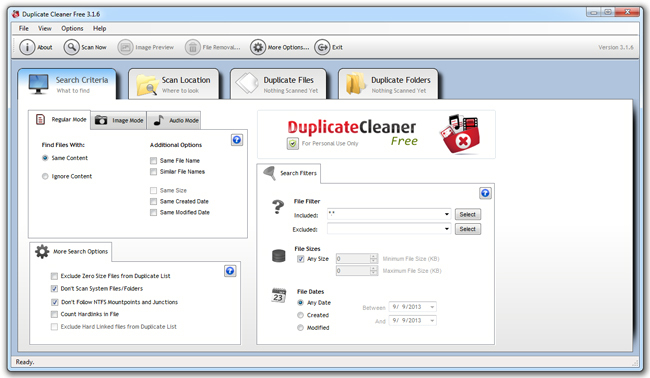 The free version of duplicate cleaner is a 5MB download and is available for all windows operating systems including windows 7 and windows 8 . The paid version of duplicate cleaner offers a few other advanced features but the free version is more than you can ask for . For this guide we will be using the free version of duplicate cleaner . you can follow these instructions below . Note: Always check the “ don’t scan system files/folders “ option . Step 1: Open duplicate cleaner and select the the search criteria as shown below . you can also select the search criteria according to your requirement . 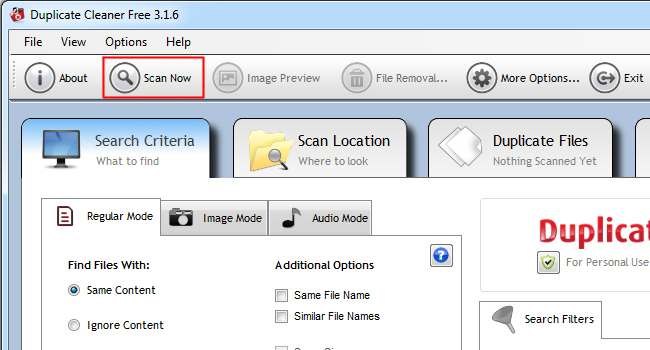 Step 2: Select the Scan location tab and add a drive or folder which you want to scanned for duplicate files . 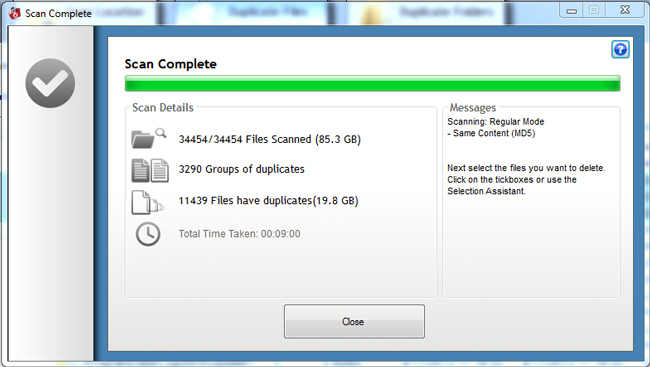 Step 3: Click the “ Scan now “ button and wait for a few minutes until the program scans for duplicate files . Step 4: It took 9 minutes to scan my drive of 233 GB , this was really quick and look at how much storage space was occupied by duplicate files on my drive . A whooping 19.8 GB ! 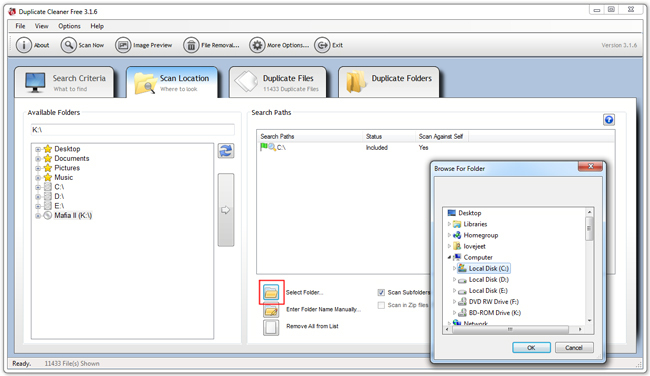 Step 5: Depending on the amount of duplicate files on your PC , you have to manually delete each and every duplicate files . As duplicate cleaner shows all the duplicate files including the original , you need to select all duplicate files except one . Step 6: manually mark the the duplicate files excluding any one of them and click on the file removal button as marked below . now you have the options to either delete the files or move the files into the recycle bin . If you are sure of what you are deleting , then uncheck the “delete to recycle bin “ option and click delete . All the duplicate files will now be deleted permanently . I hope i explained the entire process well enough , now its time for you to free up some extra space from your PC’s hard disk . Follow this guide and do let us know how much did you free up . There are many other apps to find and delete duplicate files in your PC , we will put up a list of such programs very soon .